All Web addresses mentioned were functional as of 4-30-15. From the Cumberland Gap to the Atlantic Ocean, this is Virginia Water Radio for the week of May 4, 2015. This week, we consider how a recent visit to the New River in Radford, Va., reaffirms the expression, “Life is what happens when you’re planning something else”—in this case, bird and river life! Have a listen for about 20 seconds, and see if you can guess two very different bird species that caught a the eye of a nature photographer along the river on April 29, 2015. And here’s a hint: like its baseball-playing namesakes, the first species wears bright orange; and for the second species, you don’t have to go to a sandy coastline to spot it. If you guessed the Baltimore Oriole, followed by the Spotted Sandpiper, you’re amazingly right! 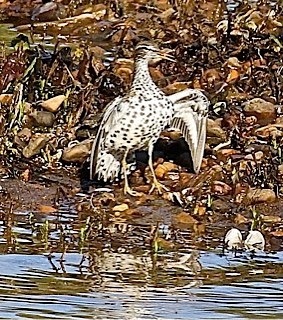 Bob Abraham of Christiansburg, Va., an accomplished nature photographer and regular visitor to the New River, said it was “nothing short of spectacular” for him to get excellent looks of a pair of orioles, a Spotted Sandpiper, and a third species, a Solitary Sandpiper—all in one day. But river time increases one’s chances of such unplanned spectacles. For example, while Baltimore Orioles are more typically heard or seen in backyards and town parks, areas along rivers and streams—called riparian areas—often provide the tall trees, open spaces, and insect prey that these birds need. 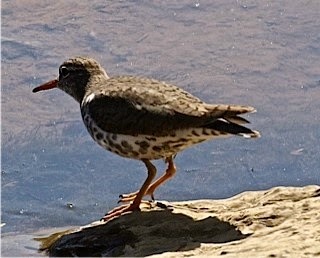 As for sandpipers, several North American species winter along the Atlantic coast but spend their summers around freshwaters, including Virginia freshwaters in the case of the Spotted Sandpiper. Also, various sandpiper species, like the Solitary Sandpiper, pass through Virginia during spring and fall migrations, and rivers can provide safe spaces for resting stopovers. Like many birds, many people also flock to rivers, for lots of reasons, including the lure of the resident or transient wildlife that might be there. As sharp-eyed Mr. Abraham said, “the fun is, you never know what you’ll see!” You can see his oriole and sandpiper photos online at virginiawaterradio.org. Thanks to Lang Elliott for permission to use this week’s sounds, from the Stokes Field Guide to Bird Songs; and special thanks to Bob Abraham for letting us in on his spectacular bird day along the New River. The sounds of the Baltimore Oriole and Spotted Sandpiper were taken from the Stokes Field Guide to Bird Songs-Eastern Region CD set, by Lang Elliott with Donald and Lillian Stokes (Time Warner Audio Books, copyright 1997), used with permission of Lang Elliott, whose work is available online at http://www.langelliott.com/ and the “Music of Nature” Web site, http://www.musicofnature.org/. Thanks to Bob Abraham for sharing his photos and comments from his visit to the New River in Radford on April 29, 2015. Thanks to Carola Haas and Sarah Karpanty, both of the Virginia Tech Department of Fish and Wildlife Conservation, for their help with the content of this episode. Baltimore Orioles (top two photos), Spotted Sandpiper (next two photos down), and Solitary Sandpiper in front of a Spotted Sandpiper (bottom photo), all along the New River in Bisset Park, Radford, Va., April 29, 2015. Photos courtesy of Robert Abraham. The Oxford Dictionary and Thesaurus-American Edition (1996), traces the word “oriole” back to Oriolus, the name for a genus of Old World birds with brightly colored plumage, with that word tracing back to the Latin word “aureus,” for “golden.” A Guide to Field Identification of Birds of North America, by Chandler S. Robbins et al. 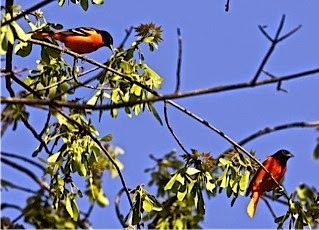 (2001; p. 302), describes orioles as “colorful arboreal icterids, quite different in habits, appearance, habitat preference, and nest structure from their ground-feeding relatives” (that is, others in Family Icteridae, the scientific family classification of blackbirds, orioles, grackles, meadowlarks, and similar species]. This guide (pp. 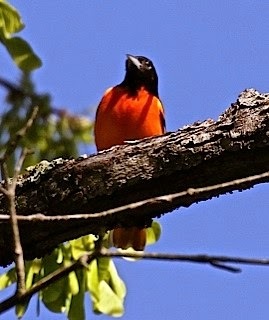 302-305) lists nine oriole species in North America, with one “rare” and one introduced from Central America; two occur in Virginia: the Baltimore Oriole and the Orchard Oriole. Just as their name’s origin suggest, all are very colorful! “Sandpipers” is the common name for the scientific family classification Scolopacidae, which includes the species named sandpipers along with godwits, curlews, phalaropes, woodcock, snipe, dowitchers, and many small shorebirds collectively called “peeps”. Birds in this family typically feature a long bill used use to find invertebrate prey in mud, sand, or other substrates. A Guide to Field Identification of Birds of North America (p. 109) describes the family as a “large and varied group of shore and wading birds, some upland, some freshwater; most seen along ocean shores [during] migration”; and (pp. 116-134) lists 57 species, but this includes several that are rare, transient only, and at least “probably extinct.” Life in the Chesapeake Bay, by Alice Jane Lippson and Robert L. Lippson (2006, p. 308) lists 13 species in the sandpiper family that are “common” or “abundant” in or around Bay waters during at least one of the year’s four seasons. 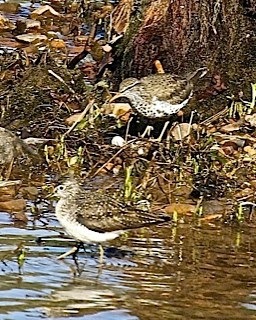 The Virginia Department of Game and Inland Fisheries’ Fish and Wildlife Information Service,” online at http://vafwis.org/fwis/?Title=VaFWIS+Species+Information+By+Name&vUT=Visitor, gives 16 sandpiper species documented from Virginia, ranging from common seasonally to very rare migrants. Cornell University Lab of Ornithology, “All About Birds,” online at http://www.allaboutbirds.org; and “Birds of North America Online,” online at http://bna.birds.cornell.edu/bna (subscription required for the latter). Virginia Department of Game and Inland Fisheries’ (VDGIF), “Fish and Wildlife Information Service” Web page (Species Information Reports for “oriole” and “sandpiper”), online at http://vafwis.org/fwis/?Title=VaFWIS+Species+Information+By+Name&vUT=Visitor. A Guide to Field Identification of Birds of North America, by Chandler S. Robbins et al., St. Martin’s Press, New York, 2001. Life in the Chesapeake Bay, by Alice Jane Lippson and Robert L. Lippson, Johns Hopkins University Press, Baltimore, 2006. The Virginia Society of Ornithology is a non-profit organization dedicated to the study, conservation, and enjoyment of birds in the Commonwealth. The Society’s Web site is www.virginiabirds.net. U.S. Environmental Protection Agency, “Surf Your Watershed,” online at http://cfpub.epa.gov/surf/locate/index.cfm. U.S. Geological Survey, “Water Resources of Virginia,” online at http://va.water.usgs.gov/. This is the home page for the U.S. Geological Survey’s Virginia Water Science Center. Virginia Department of Environmental Quality, “Watershed Roundtables,” online at http://www.deq.virginia.gov/Programs/Water/WaterQualityInformationTMDLs/WatershedRoundtables.aspx. This site provides access to online information about watershed groups in Virginia’s major river basins. Virginia Department of Game and Inland Fisheries, “Virginia Rivers and Stream,” online at http://www.dgif.virginia.gov/fishing/waterbodies/display.asp?id=163. For previous episodes on birds, please see the “Birds” category at the Index link above (http://www.virginiawaterradio.org/p/index.html). For previous episodes on the New River or other Virginia rivers or bodies of water, please see the “Rivers, Streams, and Other Surface Water” category.